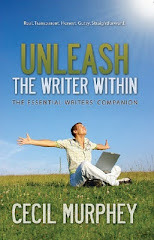 I think this topic is something that everybody can relate to whether you are a writer or not. No matter our age or gender, daydreaming is a part of who we are, it's something all of us can relate to. Cecil says, "I daydream. Often. A lot. I go to sleep at night with a concocted storyline inside my head. I let it play out until I fall asleep (which, my wife insists, is less than two minutes). I'm always the hero, although sometimes I'm the innocent who is crushed by adversity. Even when I'm victimized, I'm of stellar character and noble deeds. They may not say I am, but they certainly tell me who I want to become." He goes to write, "Daydreams connect with what we now call self-talk. Self-talk doesn't revolve around what happens to you, but what you say to yourself internally. Your inner chatter, the experts insist, determines your thoughts, feelings, and actions. They say your self talk determines the majority of you emotional choices." Cecil goes on to say "That's because the words you use to describe what is happening to you, and how you feel about external events, trigger the emotions of happiness or unhappiness you experience." I once heard a popular TV evangelist give a lesson series entitled Where the Mind Goes the Man Follows. I enjoyed listening to the series and found it really did make sense. It was a good reminder to check my thoughts and where they were leading me. Was it down a path of destruction, or a path of wholeness and happiness? Sometimes that's easier said then done, especially if you have a tendency to worry. Cecil also says the experts will tell you that if you control that inner dialog, you can control every part of you life. Cecil writes, "I'm not willing to go that far, and my position is slightly different. Listen to yourself. What messages do you hear repeatedly in you imaginings?" I agree with Cecil, we can't control what others say or do. We can only control what we will do, or not do in a situation. We are not God. I do feel as a believer we can invite the Lord into our conversations and thoughts, asking and seeking His guidance in every situation. Cecil goes on to share some stories and examples about daydreams. He mentions reading biographies of star athletes using visualization to accomplish the outcome they want. He feels that's a bit extreme for him, but he does think that self-talk is an important aspect of monitoring and directing our free-floating thoughts. I feel there is a healthy balance. Even the Bible is filled with what I would call word pictures. We can't help but see with the eyes of our heart. When ever I read or meditate on scripture I can visualize the setting or situation. It's part of our God given creativity. Cecil writes, "By noticing your daydreams, you can learn to see your long-held (maybe even long-buried) goals. Whatever your daydreams are about, teach yourself to see the goal or purpose. How does it affect you? What do they tell you about yourself?" The Aphorism for this chapter is: "My daydreams teach me what's important to me. My first task is to pay attention to them." My first task is to pay attention to them."